"Our original 'Alzheimer's in a dish ' system recapitulated the plaques and tangles typically seen the brains of patients with Alzheimer's disease, but did not induce neuroinflammation," says Rudolph Tanzi, PhD, director of the Genetics and Aging Research Unit in the MassGeneral Institute for Neurodegenerative Disease (MIND) and co-senior author of the current paper. "Studies have shown that we can have many plaques and tangles in our brains with no symptoms, but when neuroinflammation kicks in, exponentially more neurons die and cognitive impairment leading to dementia is induced. A complete model of Alzheimer's pathology needs to incorporate that 'third leg of the stool'." The updated system also brings in technology developed by co-senior author Hansang Cho, PhD, now of the University of North Carolina at Charlotte, when he was a postdoctoral fellow in the MGH BioMEMS Resource Center . 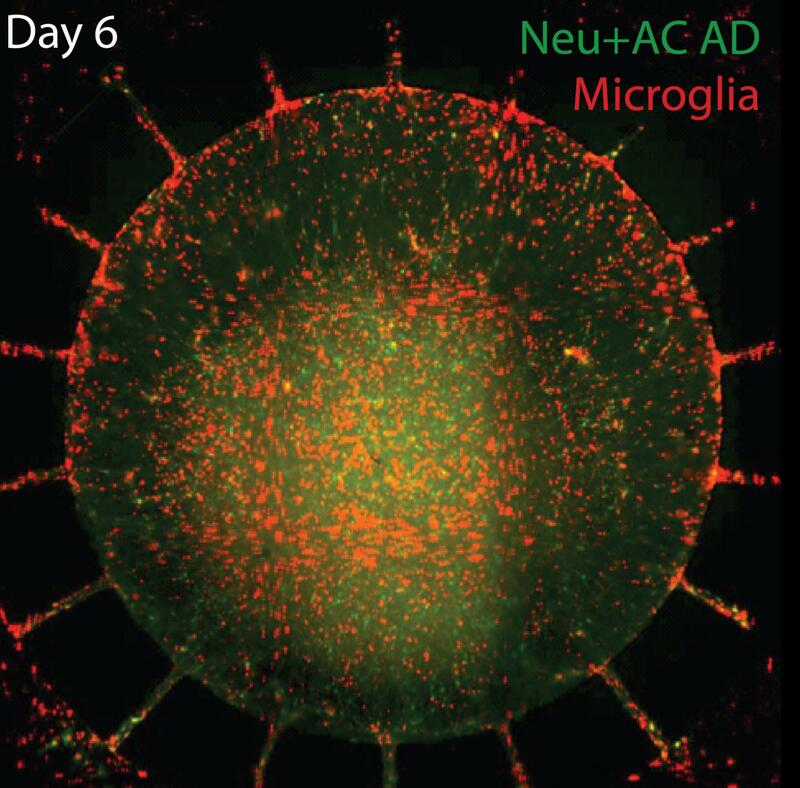 In a 2013 Scientific Journal report, Cho and his co-authors reported using a microfluidic device consisting of two circular chambers, one inside the other, to measure the migration of microglia – glial cells that function as nervous system immune cells – from the outer chamber into the amyloid-loaded inner chamber by means of connecting channels. For the current study Cho and lead author Joseph Park, PhD, of the MGH Genetics and Aging Unit, used the 'Alzheimer's in a dish' system to culture neural stem cells with FAD variants in the central chamber of Cho's device. Several weeks later, the neurons and astrocytes, glial cells that support and insulate neurons, that had differentiated were found to contain elevated levels of amyloid-beta and tau, as well as inflammatory factors known to contribute to the neuroinflammation seen in Alzheimer's disease. "We also found that blocking two receptors in microglial cells – interferon receptor gamma and toll-like receptor 4 – could prevent neuroinflammation, which opens up new opportunities for drug discovery," says Tanzi, who is the Joseph P. and Rose F. Kennedy Professor of Neurology at Harvard Medical School. "This system should help us better understand the timeline by which these pathological events lead to dementia and enable us to screen for drugs that stop plaque deposition, tangle formation and the resultant neuroinflammation." Along with Park, Kim and Cho, who is an assistant professor of Mechanical Engineering and Engineering Science at UNC-Charlotte, the co-authors of the Nature Neuroscience paper are Isaac Wetzel, Ian Marriott, PhD, and Didier Dréau, PhD, UNC-Charlotte; and Carla D'Avanzo, PhD, MGH Genetics and Aging Research Unit. Support for the study includes National Institute on Aging grants P01 AG015379, RF1 AG048080 and R01 AG014713 and grants from the Cure Alzheimer's Fund.